I am so glad my friend, Matt, highly recommended Seraphina. He spurred me on to put this at the top of my list and wow I am so excited I did. I loved the dragons, humans, and dragon/humans in Hartman's wondrous fantasy plunging the depths of love, emotions, honesty, and lies. Seraphina has a secret (well, many secrets-she is both human and dragon) and she has made sure she does not stand out in any way. As a result, she has no friends, only her uncle Orma (tutor), and a father who has created a web of lies about his dead wife and Seraphina's mother, Linn. But Seraphina has inherited her mother's love of music; she earns second in command to Virdius, the palace musician. There is a tenuous peace treaty between the humans and dragons in the kingdom of Goredd; when Prince Rufus is murdered, it looks like dragons have committed this heinous act. I loved Hartman's characters, her storytelling, and the interactions between the humans and the dragons. 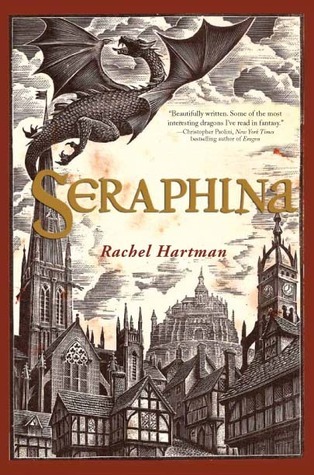 Seraphina was such a wonderful, strong character, but she was wracked with doubt as a result of her deceit that she needed to keep hidden from everyone. This was at a very large cost of Seraphina, yet she continues to try to be good, bold, and help others d hopefully herself. I enjoyed the palace histrionics with Glisselda, Lucian, Orma, and Seraphina. This book is an adventure, but it is also so much more. From court intrigue, to murder, to music, to tensions between the dragons and human, this is a superior story and I can't wait for Book 2. Sign into Goodreads to see if any of your friends have read Seraphina.